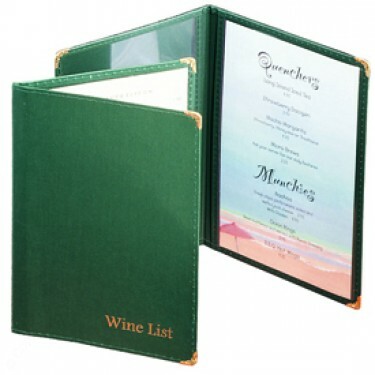 Classic Menu Covers - restaurant menu covers, classic wine menu covers, single panel menu covers, 1 panel menu covers, 2 panel menu covers, double panel menu covers, transparent menu covers, classic menu holder, menu holders. 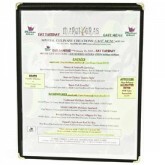 Classic menu covers for any outdoor, indoor restaurant setting or social venues for food and beverage. 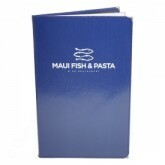 You have options of different tier level quality of covering materials such as linen bookcloth, leatherette and top grain leathers. 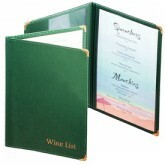 Let your customers enjoy the classic look and feel quality of your products and services. 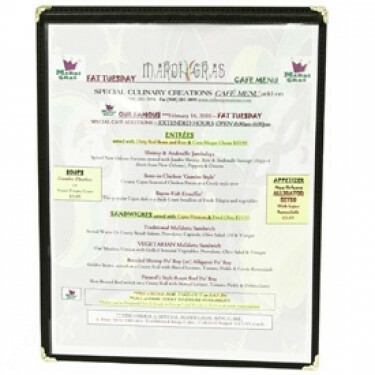 Classic Menu Covers - 1 Panel - 8 1/2 × 11"
Classic Menu Covers - 2 Panel - 8 1/2 × 14"
Classic Menu Covers - 2 Panel + Sewn in Protector - 8 1/2 × 11"
Classic Menu Covers-2 Panel-5 1/2 × 8 1/2"
Classic Menu Covers - 1 Panel - 8 1/2 × 14"
Classic Menu Covers - 1 Panel - 5 1/2 × 8 1/2"
Classic Menu Covers - 2 Panel + Sewn in Protector - 8 1/2 × 14"
Classic Menu Covers - 2 Panel - 8 1/2 × 11"
Classic Menu Covers - 2 Panel + Sewn in Protector - 5 1/2 × 8 1/2"